First and most importantly, the winner for the Project Sewing Room: essential wanna haves drawing is...lucky visitor No. 3 - Janarama! Congratulations! Yeah! I will be contacting via email for your address of where to send your surprise package! 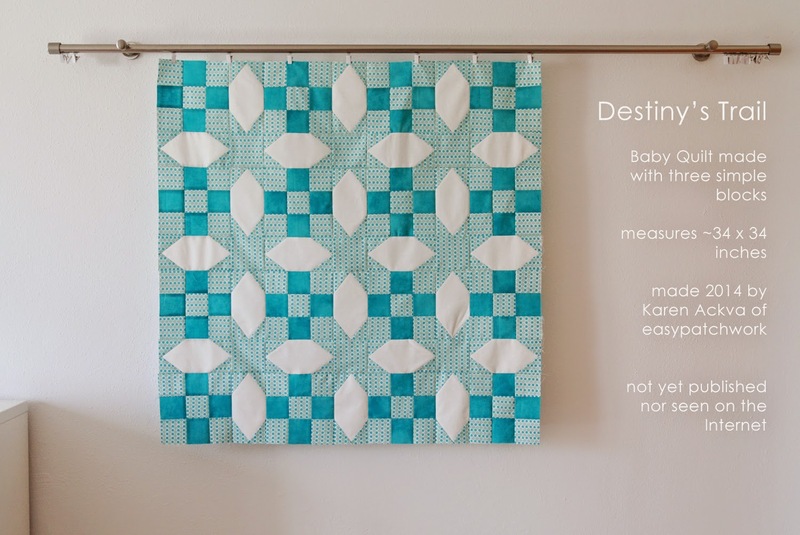 I started working on a really cute baby quilt pattern last fall and sent it in to a magazine to see if I could get it published. I never heard back from them, so I thought enough time has gone by; it's time to publish on my own. This pattern is for those of you who like a challenge. 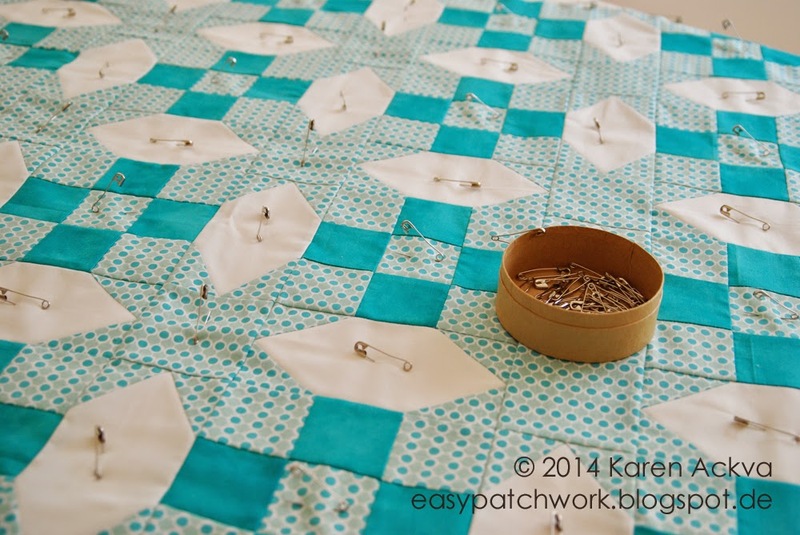 Although it is just a baby quilt, you might struggle a bit, because there are lots of points to match up. It uses three basic blocks and has several different patterns that jump out at you. BUT, I wanted the mod pods to come out more. Can you see one? 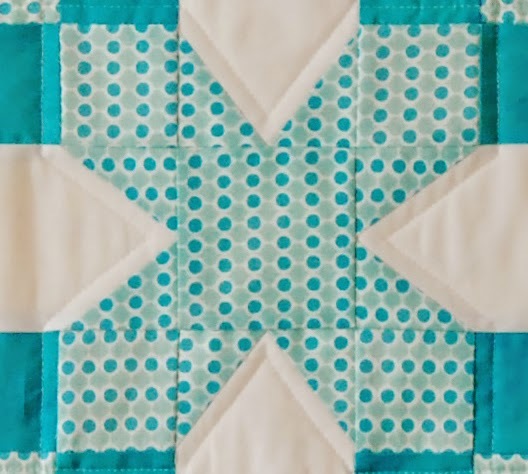 Maybe it would have been better if I had used a turquoise colored thread for the quilting? Or do you see the star? 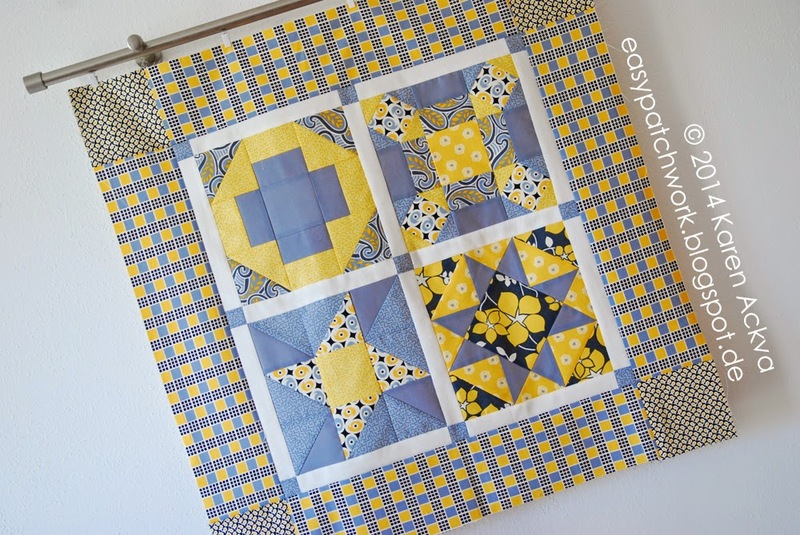 You can also highlight the star with echo quilting. I changed the name to Mod Pod Nine Patch while making this quilt, thinking about the pod chains that I wanted to stand out. I had to change the name back though. I think Destiny's Trail Nine Patch is more suited. What do you think? Which name is better? You can find more pictures here on flickr. Thanks for dropping by. And if you are interested in this pattern, check it out on Craftsy. I came across a very nice, down and dirty block contest at EQ7 to design a block at least 6 x 6 inches. 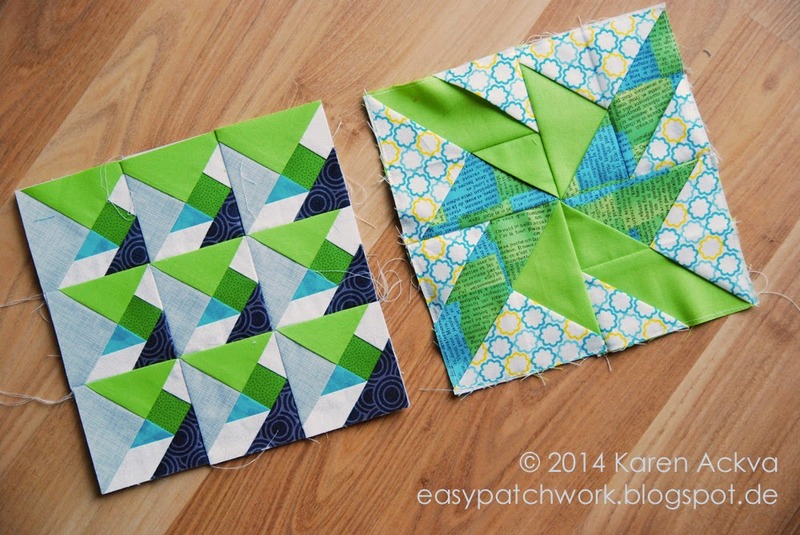 (I am continuously designing quilts and blocks and had a few stock piled and ready to use.) This is really an awesome contest, because there is free fabric from Timeless Treasures on the line. The collection will be given away - a full set of Cabana by Daniela Stout - Tonga Treats in 10", 5", 2.5" strips, 6" strips, and FQs!! I should have read the instructions several times; I thought I was supposed to design a quilt! After reading the instructions for a third time, I realized I was putting a little too much effort into it all. Also, the winner will be randomly picked, so the block doesn't have to be an original; it just has to be designed and colored with EQ7! I am a little clueless as to what this block is originally called. I am calling it an altered log cabin point. It has become a very popularized block that is log cabin assembled on paper and then the side triangles are added last. I thought I would add a strip before adding the triangle. It makes a very stunning second design. This block measures to 6 x 6 inches. I find there is a very subtle but yet effective contrast in this fabric line. There are strong blues, dark greens, a little gray and even a very light white with bubbles. I added an off white solid to lighten everything up but not too much. If you are interested in making this block, just download a template (you can find one here). Don't forget to bring in contrast fabrics in the corners. Here is a mini version which finishes at 19 x 19 inches. There is no sashing on this one. 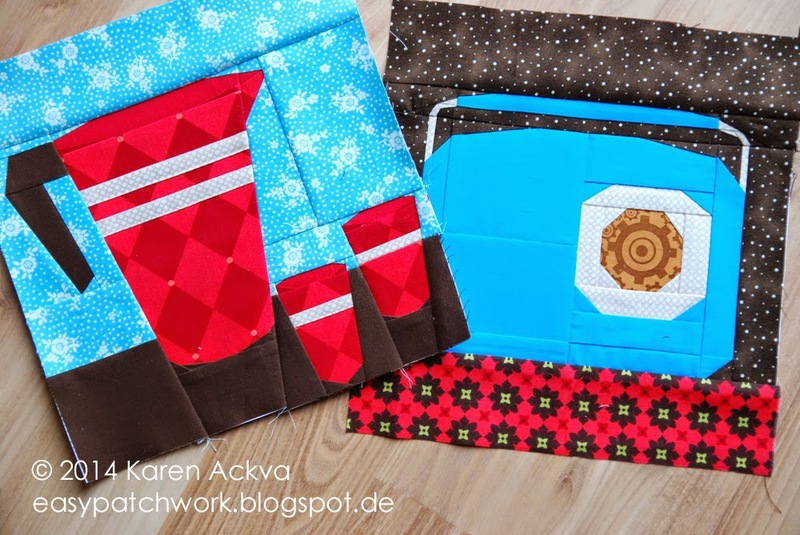 It would be great for the Doll Quilt Monthly Swap. I sat out this summer trying to catch up on other projects, but I do miss it. I loved the monthly challenges; I was thinking a whole month in advance what I could whip up. Thinking about that, if I win the contest, I will make this mini and send it to my next swap partner. Now that is a promise! Or if you want something a little more difficult, you could try this one. Both patterns will be available on Craftsy. If you want to join the challenge, you still have time. On Thursday, July 31st, you can link up your design at the EQ7 blog. I wish everyone the best of luck!! Back to the once a month posting about everything concerning your sewing room. Today I wanted to show you some essential wanna haves that can really be practical in your sewing room. What could they be? Since I live in Germany, I have some found some very nice equivalents to American counterparts. First up is a die catcher. 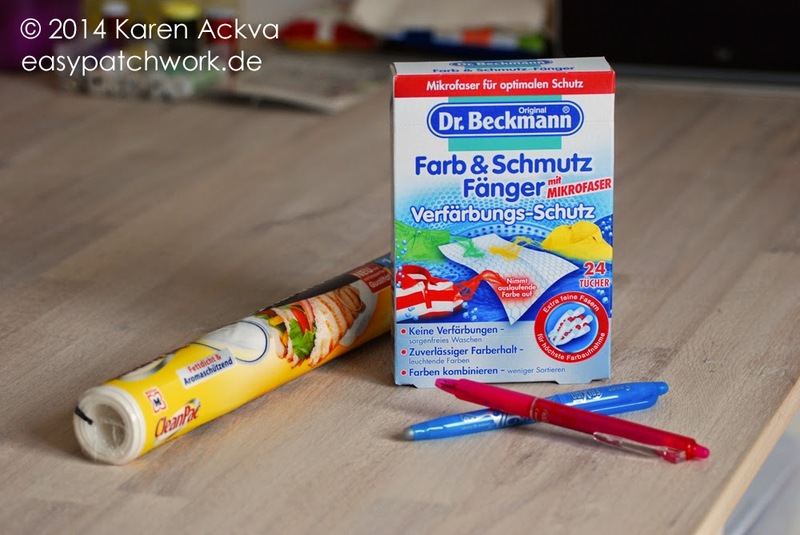 If you are like me and prefer to use precuts and are a little worried if the color is going to bleed, this is a great solution. Just put a sheet in the washing machine when you wash your quilt or patchwork piece for the first time on a gentle cycle with a gentle washing agent. Next up is freezer paper German style. There is no wax on this paper, but it is a great substitute for foundation piecing especially if your pattern is longer than DINA4. You can cut to the length that you need. It is also lighter than regular paper and easier to tear. One roll is 85 Euro cents! Third pictured above are two different heat activated marking pens. Now it is a bit of a secret around here that these pens are "magical." You won't find them in a quilt shop but at the regular office supply store. The pens are "friction" activated and the ink will disappear. You should definitely try with a warm iron and see if it disappears. I will give no guarantee if it does not. The above pictured beauty is a thread cutter and/or an SOS seam ripper. I received this from my mother many many years ago and tucked it away nicely with the two pairs of Gingher fabric scissors. I am very thankful for them and happy that I never lost them. 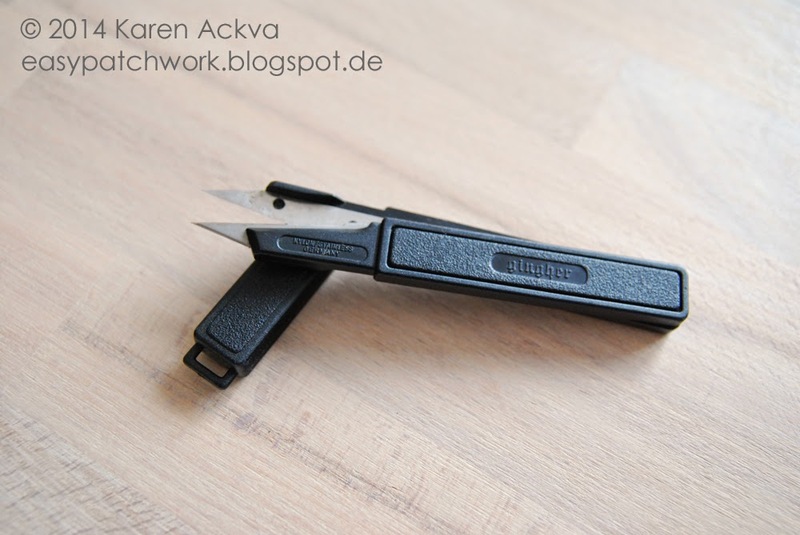 It is also a little strange that this seems to be a German company and some are even made in Germany; I have never seen them available in a store here!! I've always wanted to put a string on the end and hang it around my neck but never got to that either. This is an invaluable tool...a real essential. And finally...a really awesome goody! Something you can MAKE for your sewing room or any room for that matter. This idea came to me earlier in the year when I started thinking about Project Sewing Room. 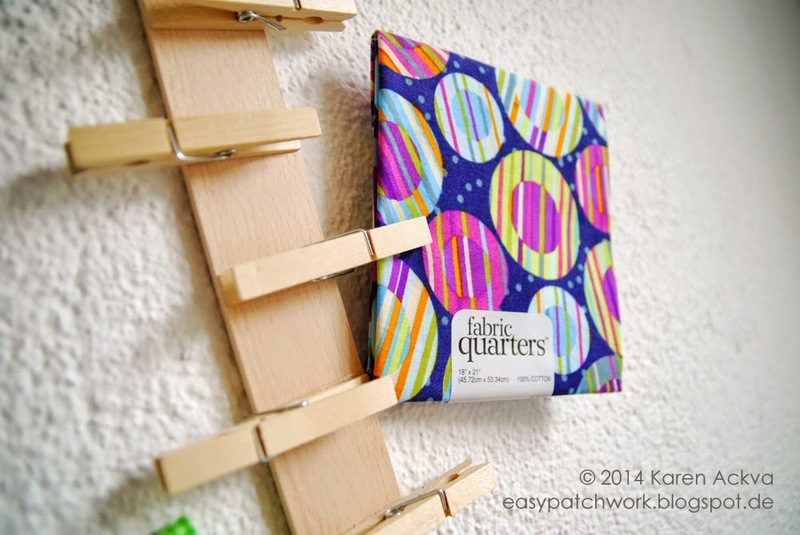 I thought of all kinds of cool ways to hang up blocks in my sewing room. This was one of them! 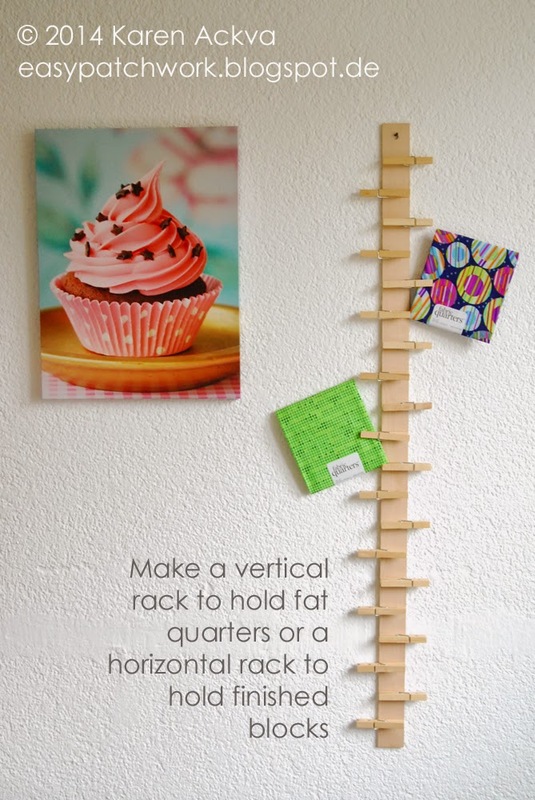 You can either make this using a horizontal stick and glue clothespins only on the bottom to hang up blocks, or use it vertically by gluing clothespins alternating on the left and right to hang up fat quarters, or postcards, or cool scrap fabrics, or notions or other cool stuff! Of course you can use a real yard stick if you wish, but since yards aren't very common in the metric world, we used a 90-95cm plain stick. We first measured 2cm from the top to drill a hole and then glued the first clothespin 5cm from the top and every 4cm thereafter. We used 20 clothespins found at a local arts store. Just think of all the possibilities you could use this for!! A photo board...an advent calender...a recipe holder...a missing sock board in the laundry room...a chore chart...a note board...a mail center...What else can you think of? I'd like to hear from you! Please leave a message and I will randomly pick a winner on Thursday, July 31, 2014 at 9am. You could be the lucky winner of ONE of the essential wanna haves pictured here. Only one entry per email address please. I really appreciate you dropping by and reading my blog. I try to answer every one's post, because it means so much to me that you leave such beautiful comments. Unfortunately, there are still a few no-reply bloggers out there that I cannot reply to. I am very sorry for that. Please make sure you leave an email address so I can contact you if you are the winner! Don't forget to sign up for newsletters or follow via google or bloglovin'. Now let's get back to sewing! This little sampler was a little more complicated. Only one of my blocks finished at 9.5" square. The rest were 9.25 or 9.125. I trimmed them to the average and went from there. Since I was using fabrics from my stash...this lovely yellow and gray from Marcus called New Wave, I decided to take a layout that would maximize my fat quarter fabrics. 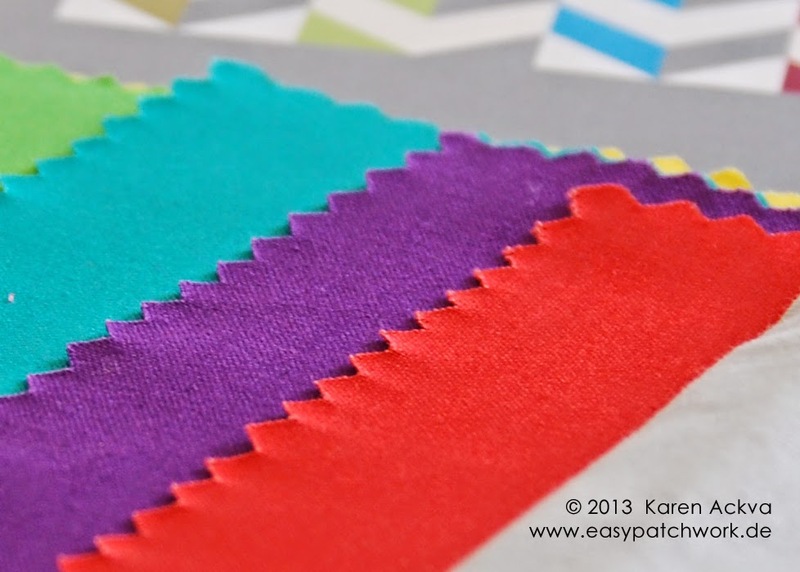 The checker border fabric was one entire FQ! I evened it up just a bit, but it still worked. I even centered it on the gray sashing corner blocks. Did you notice? I first wanted to put yellow squares on the order border corners, but the darker color allows your eye to get drawn into the sampler. Now, just to quilt. Since there is a square or a hint of a square in the center, I think that will be my starting point. Gray and yellow thread will have to come into play. You can see all of my blocks and more pictures on flickr. I am really really curious see everyone else's and to see which layout they chose! ...a Downton Abbey Junkie that is! I first got hooked on the series a couple of years ago at Christmastime. The series was being shown on ARD or ZDF with two episodes back to back for an entire week. My husband and I were immediately hooked. Now every so often a good series comes along and gets me hooked. I do like a good soap opera! I like to have one television program per week to get me looking forward to it. It has been a while since that has happened. And it is a big shame, but none of the German channels are broadcasting this series one episode per week...not that I know of at least. Anyway, we got hooked. Season One was over and done with and I wanted to watch more! So, I had to buy the next season, and we watched it together again. We watched the first two seasons dubbed in German, because my husband was having a bit of a trouble understanding them with mixed English accents. (I was too and some of the dubbing was better for some of the actors.) I asked for the third season for Christmas 2013, and tucked it away nice and neatly and waited for the perfect time to get it back out when things needed a little more excitement. This last week was that moment. I started watching two episodes a night and skipping a night. This time, I watched them in the original language!! I have become a junkie; I do admit it! I wanted to pace a little more time between them or stretch them out over a couple of months, but it simply didn't happen. I was also a little disappointed when I read on another quilt blog that she watched all three seasons and cut half-square-triangles (HST) at the same time. That's great for her BUT she told of some very important details looking forward to Season Four. I was a little sad..and intrigued and had to continue to watch more episodes. I think one or two are still unwatched..but I will not release any details! I have come to find out that Season Five is ready to be launched. That is very exciting! I can't wait..I think I have to go and buy Season Four now. What is really and truly amazing is seeing the actors out of costume...they are gorgeous! I think the biggest transformation is Mrs. O'Brien; she is a very stunning and beautiful woman who plays her part most exceptionally! Bravo! Oh..oh, oh...and I was tickled when I found out last year that there is a fabric line named after Downton Abbey. I am not too crazy about the fabrics, because I don't think they are totally in line with the era. There are lines for each of the major female characters represented in the first three seasons. Are you a Downton Abbey Junkie too? I do need some support! P.S. Season Four should arrive at my doorstep today!! Life is grand and then you are blessed with time. Sometimes I have so many ideas, I don't know what to do with them all. You would think that I am a chaot who has an idea..jumps in..and forgets all about it and starts something totally different. (I would not be surprised if my friends say that about me.) Well, I never forgot about this one. I always wanted to make it and did! It is finished!! I also took the time to write the instructions. It is called Mystic Rainbow Chevron and has three different layouts. The idea came about at end of last year when the Kona Cotton Essentials Challenge was announced and I entered it. I had a small stash of 6" Color Essentials and wanted desperately to use them up but didn't know how. I decided to make a rainbow with chevrons but mix it up just a bit. You can slightly see the pattern in the background and if you look closely, you can see it is just a tad bit different than the one shown above. Why? Because I am offering three different versions for three different tastes. What is really great about this pattern is that you are given a coloring page to design your own colorway. You can use any color scheme ranging from gradients to a rainbow or even in masculine neutrals. Have fun with this little mini. It measures about 11 x 15.5 inches. You can use it for a placemat or a tablet case panel. The pattern is all paper piecing expect for the borders...take a second look...all of the chevrons line up perfectly! 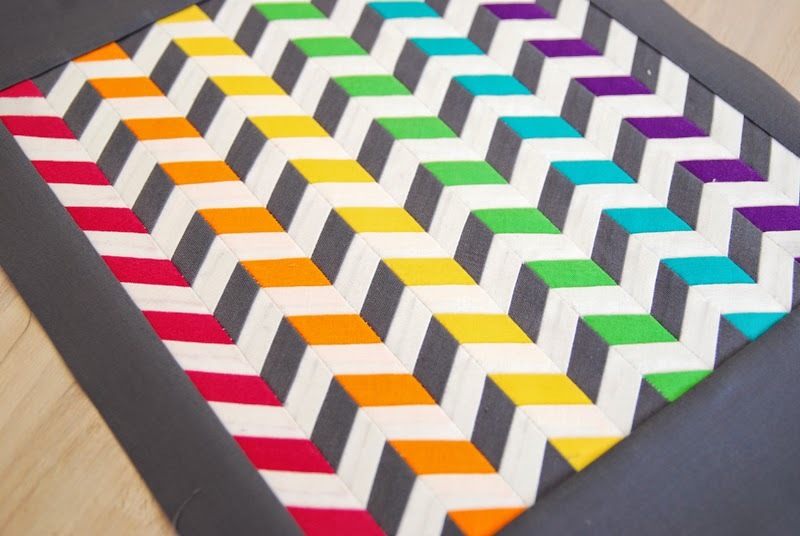 I told you I was looking for the easiest way to make chevrons that was fast and perfect...and here it is! the chevrons nest every time. You can see more examples on Craftsy. And the best part of all - the pattern will be available for a very minimal fee of $1.49! Yahoo...have fun! Motivation is a big problem right now. Is anyone else struggling with this too....summertime fun? I think we all are?! Time for sewing is very limited with such nice weather. I'd rather be sitting by the pool reading a super good book! I managed to take the time and go to my monthly patchwork guild meeting. We decided this year, several of us were going to present a block or technique for all the others to try out. At the end of the year, we should have enough new blocks for a sampler commemorating our 20 years as a patchwork group. Both of these blocks (tangram and pinwheel variation) measure roughly 19cm or about seven inches. After I made these two, I thought about making my folded star a little smaller or ripping out the borders and adjusting the size to match the others. I might even finish the puzzle block a little smaller to be more in unison with the others. I also really like to make blocks if they don't take too long to sew. You know me; I don't like it too complicated, or I just won't finish it. I think about one to two hours to complete a block is just about the right amount of time I like to take. My SewKitschy blocks take about three to four hours when I take my time and try to get the fabrics right. My North Pole blocks take much longer. My Hasenbach Challenge is just about finished and was quite easy to sew. The blocks were simple, and I kept the fabrics limited. And of course there is the Jump Start SAL. The blocks were so awesomely easy, I could fit it in between projects. How long do you like to take for your blocks? I would like to hear from you. Please leave a comment below. If you are new to the site, please follow or subscribe for updates. Summertime is the best time of the year! Unfortunately, it is not the best time to get my sewing done. There are so many other interesting things to get me out of the house and away from the sewing machine. But, I did take out some of my to-do SewKitschy blocks and start sewing again. You can download all of the patterns on Craftsy or jump in late with the free SAL from Kristy at QuietPlay. I was undecided if I was going to use this really nice turquoise blue in just a couple of the blocks or replace it with brown. Since I went back to my original plan of using primarily brown, red, and a little beige...I grabbed back to the turquoise to make it just a little more kitschy again. The radio went together really well except for the handle. It didn't really want to match up the way I wanted it too. I am curious to see what I am going to do with the front of the radio as far as embroidery or t-shirt stickers. I apologize if the photographs are too vivid. I think I have to check the settings on the new computer and/or old camera. Just two more blocks and I can write this one off. I am happy that some things are coming to an end. I need more time for other projects, but I will miss this one!! Elita has been organizing these wonderful quilting retreats for several years now inviting bloggers from around Europe to join up and share their knowledge. Different from the Fat Quarterly, Elita organizes these groups with emphasis on quality and small personal learning groups where other quilters can grow together and most importantly learn from each other. Four days of quilting, laughing, enjoying home-cooked (by someone else) meals, sauna, hot tub, massage and manicure await all of you who are simply yearning to get away from it all and spoil yourself! Is it tempting? I hope it is, because I wouldn't miss it for the world. What will I be teaching? 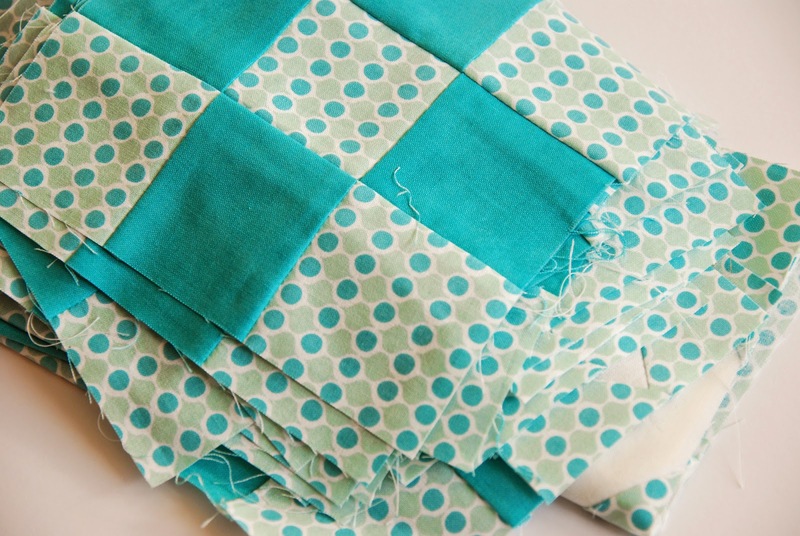 I will give a short introduction to using up your scraps especially for foundation piecing. I designed this simple leaf wall hanging called "Autumn at the Peaks". 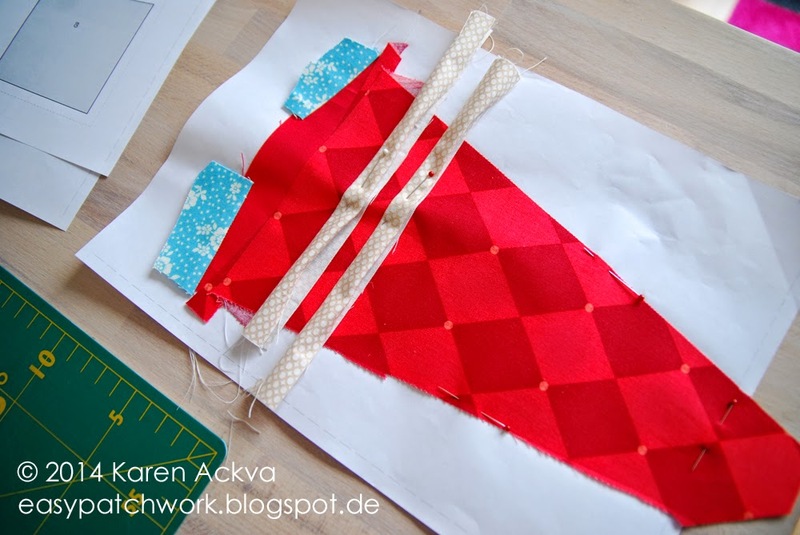 You can choose from different sizes, but the main idea is to use up those scraps. Complete instructions and material list will be distributed through Elita. After the retreat, you might even find the pattern on Craftsy. I hope you will join us on from October 2 - 5, 2014 at Patchwork at the Peaks in Morzine, France hosted by Elita. Spaces are limited, so sign up now. You can also fly into Geneva where a shuttle will pick you up and transport you the the chalet. You can find more information and pictures at the Retreat FUN-damentals of Patchwork at the Peaks 6.